THERE WAS literary justice in the first appearance of Herman Melville’s The Confidence-Man: His Masquerade being on April Fool’s Day, 1857: This Melville novel recounts the happenings on that very day aboard the Fidèle, a Mississippi riverboat. Yesterday, SimanaitisSays discussed how newspaper accounts of a deceitful New Yorker coined the term “confidence man” in 1849. In less than a decade, Melville had responded to this confidence scam and other social ills of the era in The Confidence-Man: His Masquerade. Today, our meta-review discusses the book’s relevance, back then and today. Image and annotated bibliography from xroads.virginia.edu. Librarycompany.com summarizes its plot: An unnamed and shape-shifting con man tests the confidence of riverboat passengers, each of the latter being of particularly dubious character. Among them, there’s a merchant of quack medicine, a fund raiser for a bogus Seminole Widows and Orphans Society, and a crooked stock broker. Often the question is raised, just who is scamming whom? Is this sounding as timely as today’s headlines yet? Participants in Goodreads.com offer a variety of ratings for the book, some of them five star, a few only one star. 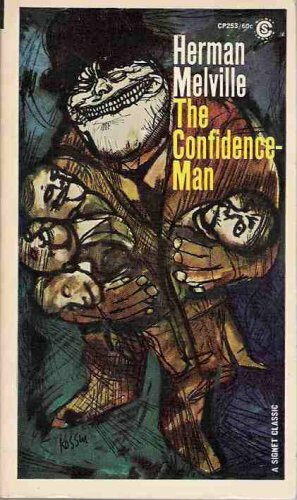 Generally, they agree The Confidence-Man: His Masquerde is symbolic of American cultural history, yet not without relevance today. The Confidence-Man: His Masquerade, by Herman Melville, Dover Thrift Editions, 2017. Image and commentary from betterlivingthroughbeowulf.com. Following from my comment yesterday and the above – it is my lay person’s opinion that the con man (actually con-man/thief) I knew was only partially or even tangentially motivated by money. The guy was clearly smart enough to hold a real job. I deduced – from multiple comments he made before his con-man status was revealed – that a lot of his motivation was proving he was smarter than people with more money than he had. Proving his superiority by being able to deceive people into giving him money basically for nothing, or stealing without being caught (even providing a patsy!). Many times since I wondered why he didn’t go into sales or marketing. I know a very dishonest guy who basically has only one talent – self-marketing – and he got elected president! This entry was posted on May 15, 2018 by simanaitissays in I Usta be an Editor Y'Know and tagged "Herman Melville's 'The Confidence Man' columbia.edu, "The Confidence-Man: His Masquerade" Herman Melville, betterlivingthroughbeowulf.com, goodreads.com, melville.org, xroads.virginia.edu.